Digging into the archives for show and tell about the work of Pietro Belluschi at the Oregon Historical Society’s museum. Pietro Belluschi’s work (including his own house, seen here) is on display at the OHS in an exhibit his architect son Anthony Belluschi (who added on to this house) opened family archives for. It’s been high season for historical house tours, weekend getaways and outdoor festivals, so finding the time for a trip to the inner reaches of a downtown museum may have eluded you – as it has me – thus far this summer. But we should all make sure to get to the Oregon Historical Society by September 9 to see the exhibit on Pietro Belluschi. The show covers the career of the Italian-born Belluschi, whose wanderings brought him to Portland as a young architect and who went on to become arguably the most prominent, prolific, and influential of Oregon’s architects even to this day. He built up his skills, experience and reputation here, helping develop the Northwest Regional Modernist style that still exerts a strong hold over the buildings we see built now. 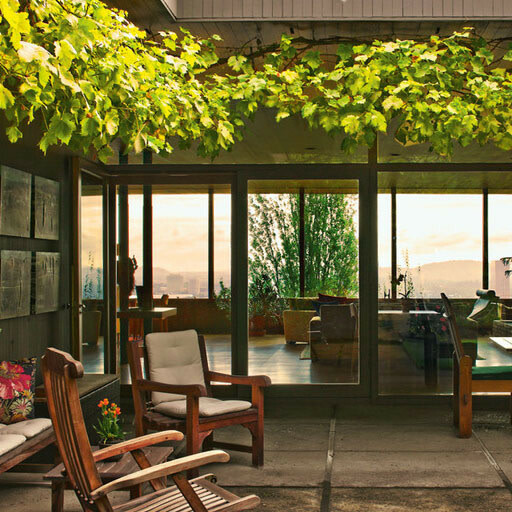 And though he left Portland in 1951 for many years on the east coast (as Dean of the School of Architecture at MIT), Belluschi returned to the town where he’d raised his children and to a house in the West Hills that he’d designed decades before for a client. That house has recently been gracefully remodeled and added to by his architect son, Anthony Belluschi. In fact, Tony has followed his father’s lead not only by becoming an architect but also by himself returning to Portland after decades leading a successful architecture practice based elsewhere (in his case, Chicago). And the home his father moved back to live in is now Tony and his wife Marti’s house. They’ve generously opened it up for occasional architecture tours and events (including an AIA homes tour last fall and for a profile written by yours truly in Portland Monthly). Now, Tony has opened the drawers to the family archives as well, to give us the inside track on his father’s long and varied career. The Architecture and Legacy of Pietro Belluschi is on display at the OHS museum now through September 9, 2012.